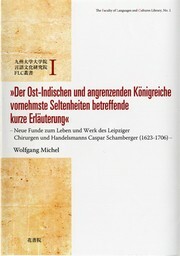 1 edition of »Der Ost-Indischen und angrenzenden Königreiche vornehmste S... found in the catalog. Add another edition? Are you sure you want to remove »Der Ost-Indischen und angrenzenden Königreiche vornehmste Seltenheiten betreffende kurze Erläuterung« from your list? Published 2010 by Kyushu University, The Faculty of Languages and Cultures Library in Fukuoka, Hana Shoin . This book presents a newly discovered text of which only one copy has survived in the Dresden State Art Collections (Staatliche Kunstsammlungen Dresden, Muenzkabinett). It was dedicated to the Duke of Saxony Johann Georg III. and published in 1686 as a private print under the title "Short explanations of the most distinguished rarities in East India and the neighbouring kingdoms". The author Caspar Schamberger (1623-1706) who had been in Asia for twelve years working as a surgeon on VOC ships and in Dutch trading posts is known as the "father" of the first fully-fledged Western-style surgery school in Japan. His text describes fruits, plants, animals, people, coins etc. from Persia to Japan including the Khoikhoi (Khoisan) in Southern Africa. This is one of the earliest Western accounts of these matters based on observations made during the late 1640s and 1650s. 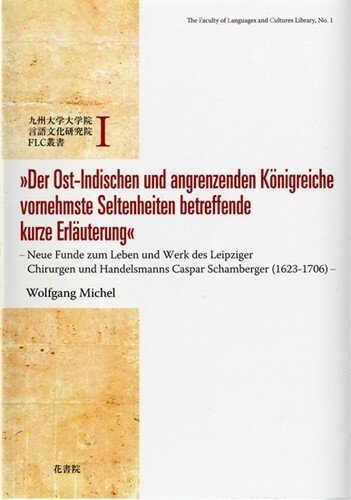 The extensive commentary (126 pages) gives an outline of Schamberger's life presenting numerous new information on Schamberger's activities after his return to Leipzig in 1658. Schamberger's descriptions are analysed in detail within the context of similar accounts of nine contemporary German travellers: Caspar Schmalkalden, Zacharias Wagener, Heinrich Muche, Johann Wilhelm Vogel, Elias Hesse, Albrecht Herport, George Meister, Andreas Cleyer, Engelbert Kaempfer. Forty-six illustrations selected from Western and Japanese sources convey the iconographic background. December 18, 2015 Edited by Wolfgang Michel Edited without comment. December 18, 2015 Created by Wolfgang Michel Added new book.